Being a female small business owner is no easy feat, and it can be even tougher when it comes to team camaraderie. Your first company retreat is a huge deal, but a lot of entrepreneurs think of it like a wedding: It’s easy to go bigger, more expensive, and get much more complicated than it needs to be. While Harvard Business Review urges everyone to have friends at work, it’s partly the job of the business owner to make relationships blossom. You don’t have to spend a lot or days together in order to get the benefits. In fact, you’re not even “required” to have a company retreat at all. It depends on the kind of business and environment you want for your company. Some companies are a lot more laid back than others, and Business Insider recently reported on the best companies to work for that allow for personal time, too. However, if you’re the type of entrepreneur who wants a solid group of professionals working in tandem, a company retreat can help. 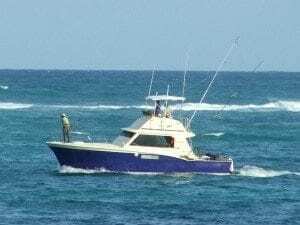 Chartering your own fishing boat with a company like IHU NUI is a great way to enjoy the outdoors and work together as a team in a small environment. Plus, it’s suitable for people of all ages and abilities (simply “boating” instead of actively fishing is also an option). You can choose how long you’re out for, so you can customize it to fit your budgets and needs. It’s also a fantastic way to learn a new skill at the same time. Nothing compares to the pizza parties of your youth when all you needed were a few slices from a favorite restaurant, some games and the right people. If you can swing it, have the party off the company premises (and maybe even in your own home). You can also ask if anyone would like to host the party, ensuring everyone stays to clean up, too. This kind of host switching is a fantastic way to learn more about employees one at a time. This depends on your employees (it might be a challenge if you have any workers with mobility issues), and remember that you might not know about all types of disabilities. However, there are numerous options for nature walks no matter where you live, but going with one ranked “easy” is always best. If you’re not sure about ability (and it’s illegal to ask), you can always take an anonymous vote to find any issues. Your team can either attend an established painting/crafts class or you can have a professional come to you. Mix in some snacks and beverages, and it’s a great way to let everyone show off their creative side while still encouraging communication. In fact, the National Endowment for the Arts encourages art classes for adults, citing numerous health and bonding benefits. From oil painting to basket weaving, you can choose the craft based on cost, preferences and availability. There’s at least one official holiday happening every single day, and you can create your event around that. National Ice Cream Day is a favorite, but just make sure you offer lactose-free and sugar-free options as well. Get creative and ask your employees for input. A company retreat is really about growing stronger as a team, so it doesn’t matter what the accessories are. If your team isn’t bonding, it’s a party (not a retreat).